Over these many years, I have worked to challenge high-stakes standardized testing. 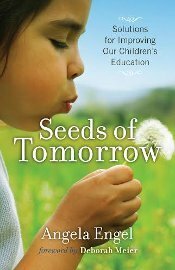 I have published a book and articles, written legislation, lobbied on behalf of kids, spoken to audiences, organized and educated. I’ve come to understand that the public’s collective will and their intolerance for injustice is the greatest agent of change. We can still try and change the laws, we can continue to inform the people, and we can also refuse to conform. We can live by a different set of rules; standards that respect our children; choices that are responsible to our spending; and decisions that heal the opportunity divide and lead to cooperation. I have randomly gone through the names of those who have been strong activists in the past for our billboard campaign to inform parents of their rights to exempt their children from the fraud of high stakes standardized testing. 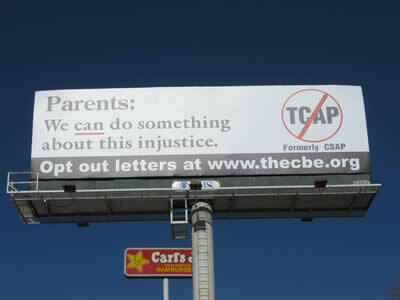 As most of you know, we have advertised on Colorado highways since 2005 to raise awareness of the boondoggle of CSAP (now TCAP) and each year more and more parents have opted their children out of the tests. This is a critical year for voices raised against the corporate takeover. They are more forceful than ever. Consider the latest publications – Diane Ravitch’s Reign of Error, Jim Horn’s The Mismeasure of Education. The Progressive has a new website exposing the corporatization of public education, www.publicschoolshakedown.org. The strike of the Chicago Teachers’ Union a year ago had much to do with raising awareness of the privatization of what is a public trust – public education. Our mission has also been included in the wonderful collection of stories in Educational Courage: Resisting the Ambush of Public Education by Professors Nancy Schniedewind and Mara Sapon-Shevin. I have just signed a contract with Mile High Outdoor Advertising to put two billboards up on the Eastern Slope. We will have these boards from January through March and I am attaching two photos of last year’s boards. Those two boards will cost us $2,200. We have a bank account in the Weld Schools Credit Union which now has about $500 in it. So, we need to raise something like $1,700 to cover the cost of the boards. We have no administrative costs whatsoever. So, however you could spread the word, however you could contribute to this campaign will be very much appreciated. Any contribution at all will help move us toward our goal.